Graduation Day can be a whirlwind of activity and emotion as you bid farewell to your years as a Butler student. Perhaps you recall the nervous feeling as you processed into the crowded room, hoping you were in the right spot. Maybe it’s the pride you felt as you switched the tassel on your cap from right to left that’s stayed with you. Or the anticipation as the reading of the graduates’ names inched closer to yours. What you may not recall, however, is the name of that prominent person who delivered your Commencement Address. Here are the last 50 years’ Spring Commencement speakers to help refresh your memory. 2016, Jill Bolte Taylor, PhD, CEO, My Stroke of Insight, Inc.
2001, Dr. Bertice Berry, sociologist, author, lecturer, and educator. 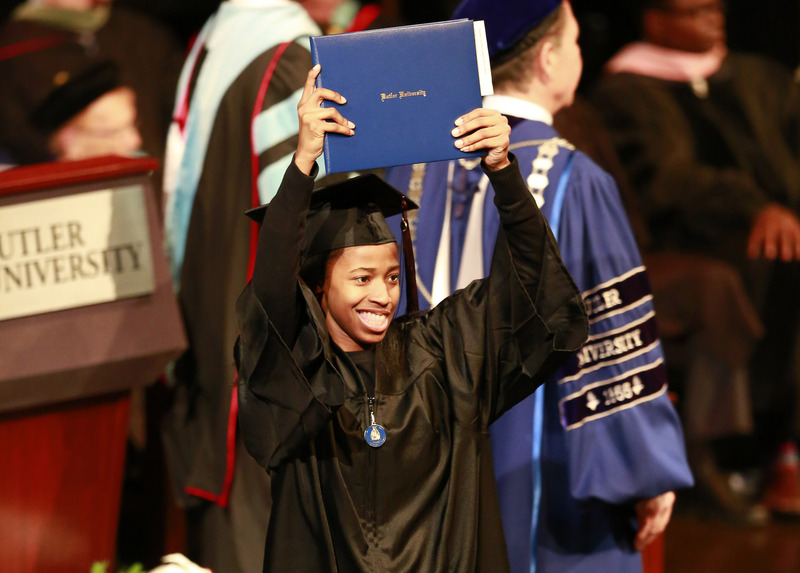 One hundred fifty-one students became alumni on Sunday, December 21, at Butler University’s winter commencement. Graduates include 47 from the College of Business, 42 from the College of Liberal Arts and Sciences, 30 from the College of Education, 17 from the College of Communication, nine from the Jordan College of the Arts, and six from the College of Pharmacy and Health Sciences. Jauvon Gilliam ’01 and Betty Kessler, who earned her teaching certificate from Butler in 1937, received honorary degrees. Kessler, 97, arrived at Butler in 1935 with only one dress in her suitcase and a strong determination to become a teacher of young children. She completed the two-year certificate program at Butler that was required at that time to become an elementary teacher in Indiana. She later earned an education degree through Indiana State University, but regrets that she did not receive a four-year degree from Butler.